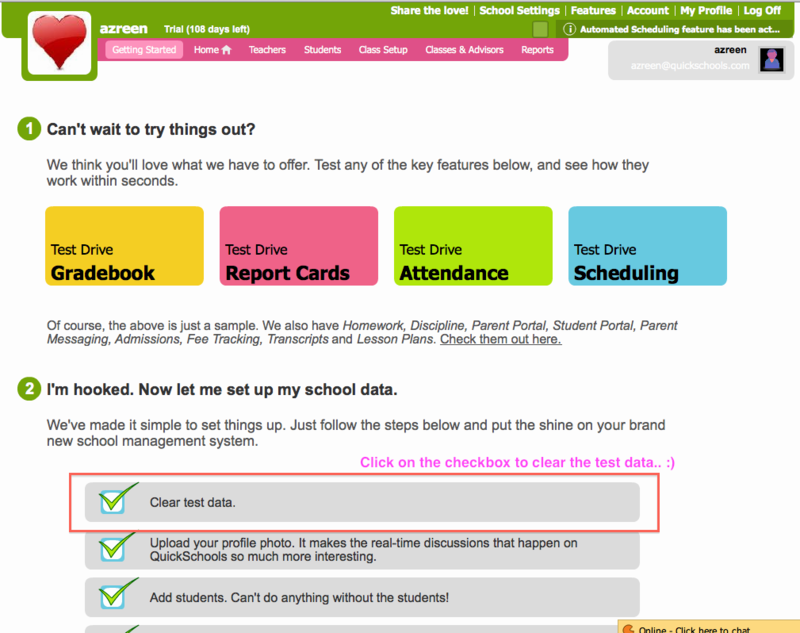 Remember to clear the test data in your account! Occasionally in some of the newer accounts, users will realize that there are unfamiliar names in the midst of your students’ list. You may have seen names such as Amber Phillips, Alvin de Silva, Felicity Bradshaw, etc under the Students tab. Why is this? Remember, when you first start your trial, the account has some test data so that you can see how the major functions of the system work. And sometimes, as you move from testing the system during the trial to using the system properly to run your school, you may have not realized that those students are still in the list. Once you remove the test data and the Getting Started page, you may lose some of the Features you may have turned on during the test mode. Do not panic. 🙂 Just go back to the Features screen and turn those back on. All your data will be restored safely e.g. Gradebook, Homework, Attendance, etc.